For the first time ever, the animated adventures of the #1 paid mobile app of all time are brought to life when Angry Birds Toons: Season One - Volume One dive bombs onto Blu-ray and DVD Dec. 3 from Sony Pictures Home Entertainment. Just in time for the holiday season, Angry Birds Toons, the next installment in the $2 billion global Angry Birds franchise, brings to life the characters and adventures from one of the most beloved games in history, now as episodes for the whole family to enjoy. Join Chuck, Matilda, Red, Bomb, the Blues and Terence as they attempt to thwart the wily plotting of the Bad Piggies in 26 hilarious episodes, encompassing more than 70 minutes of entertainment. Even if you have managed to avoid playing the Angry Birds video games, you've probably seen them somewhere. If you have been living under a rock, I will summarize. 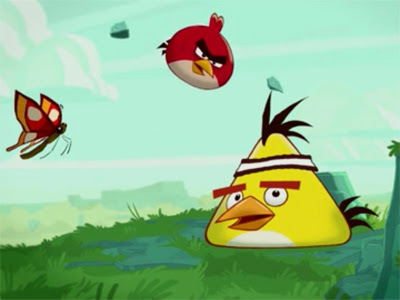 Angry Birds is a game in which you slingshot various birds (angry ones) and knock down structures. There are many variations on the game including Rio, Seasons and Star Wars. The birds each do different things when launched. The blue ones split into three birds, the yellow ones can speed up, black ones become bombs and in the case of Angry Birds Star Wars they shoot blaster bolts and swing lightsabers. The goal of the game is to knock down the structures in order to destroy the piggies. 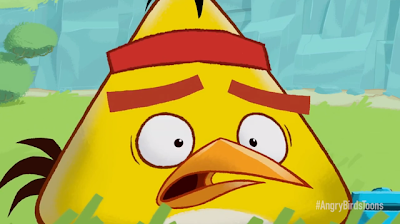 Angry Birds Toons Season One Volume one contains 26 episodes. Each episode is less than three minutes long. 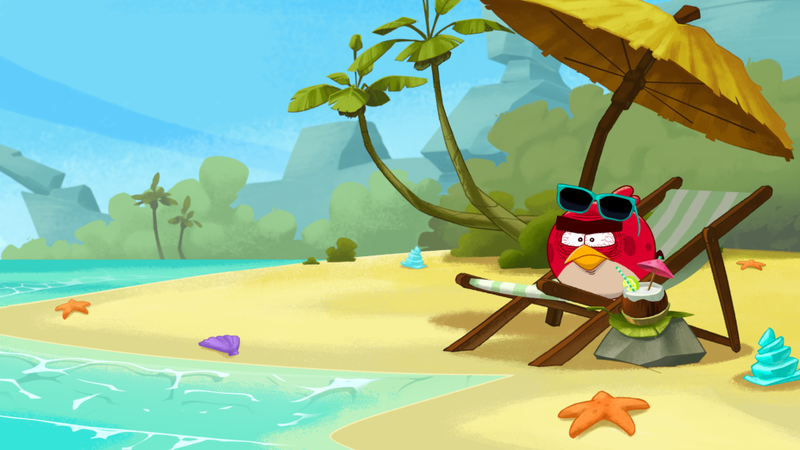 Angry Birds Toon Season One Volume One brings to life all the characters from the game in 26 mini episodes. Red, Chuck, Matilda, Bomb, Blue and Terence (yes they have names) protect their eggs from the Bad Piggies in this Blu-ray release. Angry Birds is available on smart phones and video game systems and my five year old is significantly better at it than I am. I actually do enjoy playing the game but I don’t enjoy the sounds the birds and the pigs make. I was curious about what Angry Birds Toons would be like when they don’t speak in the game. Unfortunately, the birds don’t speak in the cartoon either as there is no dialogue of any kind. The birds communicate through the same yips and squeaks they use in the video game. The Angry Birds on Piggy Island have a rough life. The basic theme of all the episodes is that the birds are trying to thwart the bad piggies. As a parent I’m always looking for animated things that both kids and adults will enjoy. 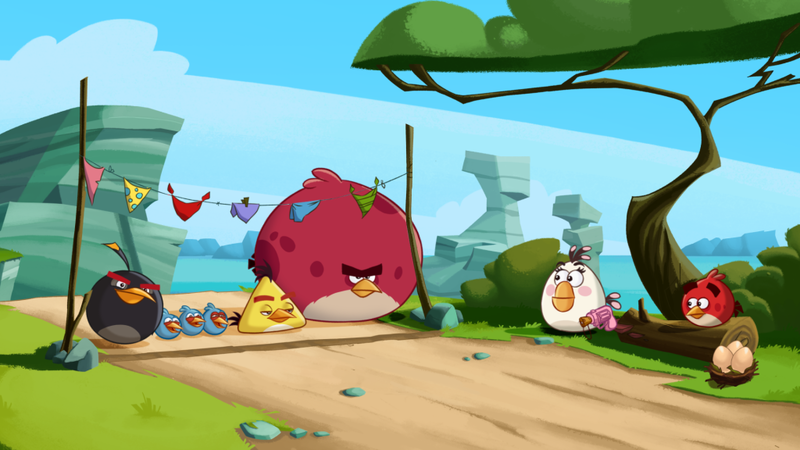 Angry Birds Toons is the kind of things the kids will love but it fails to entertain parents. Its target audience is likely two to three year olds who like bright colors and have short attention spans. Often a series based on a video game is a recipe for failure. The games are usually better and the plot translations just don’t work. In the case of the Angry Birds games there is no plot. I expected the filmmakers to create a plot to explain why the pigs hate the birds. That didn't happen in these fairly disappointing cartoons. 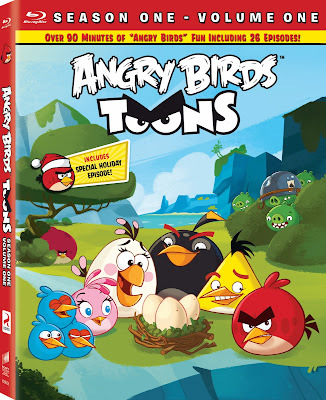 Angry Birds Toons: Season One – Volume One is presented on Blu-ray in 1080p high definition. The show is very colorful and the colors are bright and vivid. The primary colors stand out but black levels are also good. The images overall are clear and crisp and the video quality is better than I would have expected for an animated series of this type. 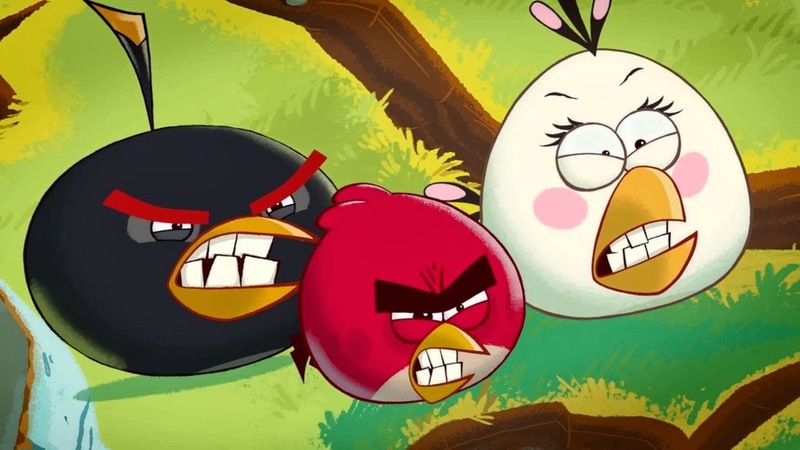 Angry Birds Toons: Season One – Volume One has a Dolby Digital 2.0 soundtrack. With no dialogue in the show, the 2.0 track is sufficient to carry the music and sound effects. Meet the Characters - Clips featuring Blues, Chuck, Matilda, Red, and Pigs can be selected individually or with a play all feature. Each clip is under a minute long. Meet the Flock – Additional clips featuring the primary and secondary Angry Birds characters. Behind the Scenes - A look at the series, story and art which can be selected individually or with the pay all feature. This is the first feature with dialogue. Wreck the Halls – The holiday themed episode. Character Art Gallery – Nine sketches that can be viewed individually or as a slide-show. For kids, they would probably rate this 3 1/2 out of 5, but for adults it gets a strict 1 1/2 out of 5 so I’ll split the difference and call it a 2.5. The best use of this show is probably a viewing on a smart phone designed to keep a toddler busy in line at the grocery store. The episodes are extremely brief and after awhile they start to seem pointless. Maybe I’m asking too much from a game without a plot. I am probably one of the few people that truly enjoyed both the Pac-Man video game AND the cartoon series. 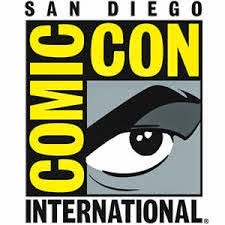 I was expecting Angry Birds to be more the Pac-Man game and include clear stories and most importantly dialogue. For the adolescent Angry Birds fan, this would make a good stocking stuffer this Christmas. For the adult Angry Birds fan, you might want to rent this release before buying it.